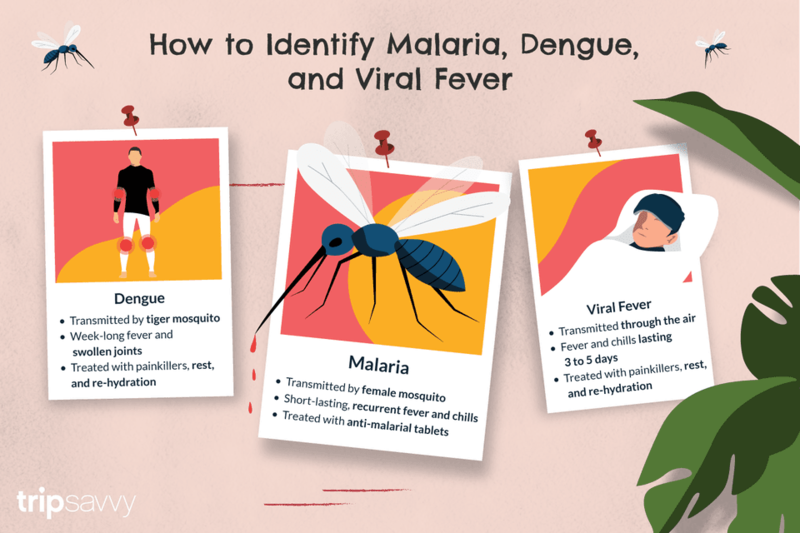 Malaria, Dengue & Viral Fever: How to Tell Difference? Malaria, Dengue & Viral Fever: How to Tell the Difference? During all my years living in India, I've had a wide range of monsoon related-illnesses -- viral fever, dengue fever, and malaria! The troublesome thing is that many monsoon related illnesses share similar symptoms (such as fever and body ache). Initially, it can be difficult to know what you're suffering from. However, although the symptoms may be the same, there are some noticeable distinctions in the way that they occur. Viral Fever -- an intense fever that lasts for three to five days, accompanied by severe chills and body ache. I had it twice in beach-side Varkala, one of the top places to visit in Kerala, during the very wet monsoon there. Both times, it lasted for three days, then went away as quickly as it came. Dengue Fever -- a fever that lasts for up to seven days often with a drop and then small resurgence towards the end (biphasic pattern), plus headache, swollen and painful joints, and then a rash. After the fever, my finger and toe joints swelled and started hurting, and I got a pin-prick looking rash over my legs, arms and torso. Malaria -- a short lasting, recurring fever, accompanied by chills and body ache. The short duration and recurrence of symptoms are what really distinguish malaria from other illnesses. My fever and chills lasted around five hours at a time, but returned every second day (consistent with the parasite life cycle). It felt like the start of a flu that would mysteriously come and go. I was infected with malaria while living in Mumbai, during a widespread outbreak one monsoon season. Malaria is a protozoan infection that's transmitted by female Anopheles mosquitoes. These stealthy mosquitoes fly more silently than other types, and mostly bite after midnight and up until dawn. The malaria protozoa multiplies in the liver and then in red blood cells of an infected person. Symptoms start appearing one to two weeks after being infected. There are four types of malaria: P. vivax, P. malariae, P. ovale and P. falciparum. The most common forms are P. vivax and P. falciparum, with P. falciparum being the most severe. The type is determined by a simple blood test. How Do You Get Dengue Fever? Dengue Fever is a viral infection that's transmitted by the tiger mosquito (Aedes Aegypti). It has black and yellow stripes, and typically bites in the early morning or at dawn. The virus enters and reproduces in white blood cells. Symptoms usually start appearing five to eight days after being infected. The virus has five different types, each of increasing severity. Infection with one type gives lifelong immunity to it, and short-term immunity to the other types. The Dengue virus isn't contagious and can't be spread from person to person. Most people will only have mild symptoms, such as an uncomplicated fever. How Do You Get Viral Fever? Viral fever is usually transmitted through the air by droplets from infected people, or by touching infected secretions. The types and severity of both dengue fever and malaria are variable. I had mild cases of both (including P.vivax malaria, as opposed to the life threatening P.falciparum). However, when dealing with malaria, you must get it treated as soon as possible, before the parasite has a chance to affect too many red blood cells. If you start feeling severely chilled, get to a doctor for a blood test (although keep in mind that the infection may not show up positive straight away). Treatment of uncomplicated cases is quite straightforward and simply consists of taking a series of anti-malarial tablets, first to kill the parasites in the blood and secondly to kill parasites in the liver. It's important to take the second lot of tablets, otherwise the parasites can reproduce and again re-enter the red blood cells. As dengue fever is caused by a virus, there's no specific treatment for it. Instead, treatment is directed towards addressing the symptoms. It may include painkillers, rest, and re-hydration. Hospitalization is usually only necessary if adequate fluids can't be consumed, the body's platelets or white blood cells drop too much, or the person becomes too weak. Regular monitoring by a doctor is necessary though. If you're concerned about the possibility of catching any of these illnesses in India, the most important thing to keep in mind is the climate. The prevalence of illness does vary every year, and from place to place in India. Malaria isn't a real issue in India during the dry winters, but outbreaks of it do occur during the monsoon, particularly when it's raining constantly. The more severe falciparum strain of malaria is most active after the monsoon. Dengue is most common in India during the few months after the monsoon, but also occurs in the monsoon season. India's monsoon season does require extra attention to be paid to health. These health tips with help you keep well during the monsoon season. How Risky is Couchsurfing in India and Should You Do It?